7.97 points at 66 votes (rank 87). Rombachs C64-Spieleführer 7 1984 - "Mark 3"
The hardworking miners of "Mount Leone" have been locked in the lower pits of the cave system through sudden volcanic activities. Our hero "Roderrick Hero" now starts for the search of the missing persons with his special equipment (backpack helicopter, integrated helmet laser and dynamite). After a successful rescue you reach the next level. In the pits lurk different creatures such as spiders, bats, poisonous moths or snakes. To remove the vermin, you should use the laser. At some rivers, an invincible, hungry sea monster appears that constantly follows our hero. Some walls that contain magma sediments glow red and mustn't be touched. The pits spread far vertically and horizontally into the interior of the mountain. Sometimes walls, which you need to blow away with dynamite, block the way. At the beginning of every level, the player gets 6 bars of dynamite. After the ignition Rod must move away fast or else he will lose a life. A heat resistent raft can be used at some places to cross the lava river. Lanterns light the dark pits. A shot or a touch is enough and the light goes out forever. The energy is filled up at the start of every level. When the full energy is used up, the player loses a life and starts again at the beginning of the level without filling up the dynamite supply. The number of lives is displayed by small hero icons in the lower left area. In the lower right the current number of points is shown. At 1.000.000 the points jump to "!!!!!!!!!!!!". No further score is recorded, even if you run out of lives and start a new game. If you run the risk of running into a glowing wall after igniting a dynamite bar, you can use the laser to evaporate the wall. This method is safer, but also more time consuming (about 10 seconds). For training you best use the version by the cracker group Remember. Here several training modes are available (unlimited lives, unlimited dynamite, unlinimited energy, level jumps, and more). Sledgie: "Nice Arcade – Game. It is easy to learn and lots of fun." Guybrush: "Not outstanding but okay." Rombachs C64-Spieleführer: "Despite the honourable mission, an initial motivation is quickly reduced (Vote 3 - September 1984)"
Rockford: "A very good game of skill, as Sledgie already mentioned: easy to learn, but very hard to master. In any way, my motivation doesn't decrease, even after 20 years, maybe after a perfect round, but who can claim he ever had one? Every death is only the fault of the player, this is very fair. A nice idea is the effect in a dark room, when a dynamite bar is lit up. I love this game, I am welcome to give it 8 points." TheKills: "Interesting game, even though it is a bit hard at some points. For me it belongs into a good collection." Shakermaker303: "This is a classic for me personally. I can remember that one also liked to play that on the ATARI 800XL, but I liked the conversion in the C64 more. 10 out of 10 points - I need a H.E.R.O.!" The Heist: "Also one of my faves. When you have started, you cannot stop that soon. Nice are also the rising levels of difficulty, that offer enough occasion to improve the technics. I still have the exact reverberant sound in the ears, when you accidentally crashed into a bird. It was also nice, when you could blow up something and the the whole cave world was alight. Despite the mentioned rising of the difficulty the game can be made, which was not the case with every game (some games just start at the beginnung and only get a bit faster or get more enemies). We thought about the resuced guy anything between funny and stupid, always lifting his hand when the Hero came to him. 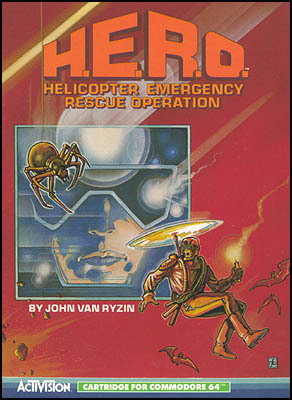 Hero surely belongs to the most important C64 games of the early time." Shmendric: "Simple game principle which can get quite addictive! I've spent ours with it. 10 points, no doubt." Blubarju: "H.E.R.O. was and still is one of my absolute favourite games. Here (alomst) everything is right: graphics, controls and a moderate grade of difficulty. It could only have a bit more sound. But the way it is now, it is already super. 9 points." Bamse: "This belongs for me to the absolute "basic"-classics. Simple game principle that absorbs one for a long time. No sign of "fast reducing motivation"! On the contrary: the one who knows the first levels by heart will try to fly through them faster and faster. Very soon the end of the level is not the aim, but the time needed. H.E.R.O. veterans (like me) can straightaway fly through the first levels blindfolded even after 20 years..."
Farador: "I received the game for the Atari 2600 as a gift in those days, by far one of the best games for this console. 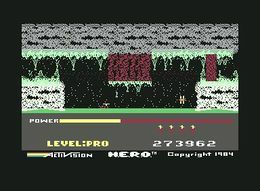 I hadn't played it that intensely on the C64 any longer, similar to Pitfall 2, as in 1985 there were far better games. Nontheless an absolute classic -> 10/10 points." Rule: Here the special Competition Version by tnt/beyondforce is used, where you receive no extra lives (8-digit score display). Competition Version by tnt/beyondforce on Magyar Commodore 64 H.Q. This page was last modified on 2 April 2019, at 03:54.